Ausgrid is the electricity distributor of one of the largest electricity networks in Australia. The Ausgrid network distributes electricity to 1.7 million customers in major cities in New South Wales in a 22,275 square kilometre area. Ausgrid was formerly known as the energy supplier EnergyAustralia. Ausgrid was formed after EnergyAustralia was sold by the New South Wales government in 2011. Between 2011 and 2016, the restructured Ausgrid was owned by the NSW State Government. In 2016, the NSW Government sold a 50.4% share of the company to form a partnership with AustralianSuper and IFM Investors. This Australian-based consortium holds their share of Ausgrid under a 99-year lease. The Ausgrid electricity network distributes over 300,000 Gwh of electricity on a yearly basis to its 1.7 million customers through 49,000 km of underground cables and overhead electrical wires. 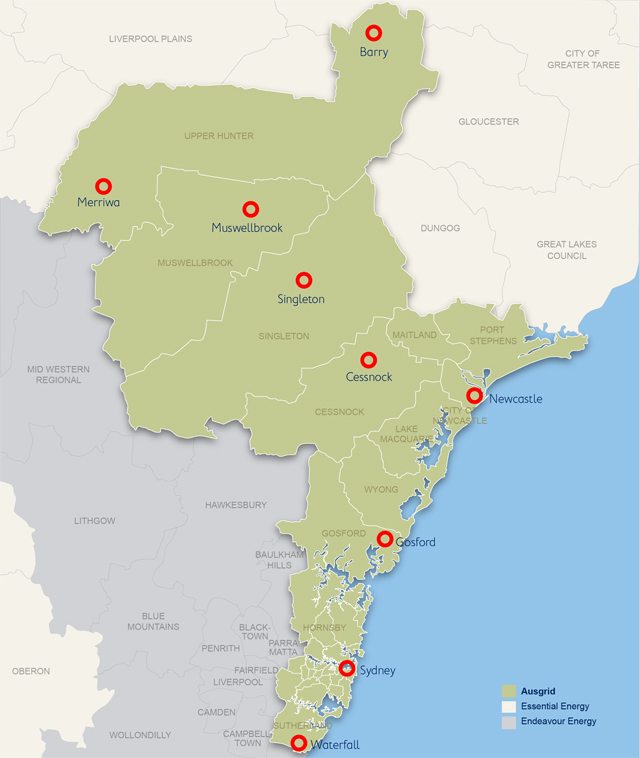 The Ausgrid electricity supply comes from the New South Wales transmission network at 132,000 or 66,000 V. The electricity is reduced into increments of 33,000, 22,000, or 11,000 V through a transmission network and zone substations to supply electricity to customers and businesses in New South Wales. 1. Reduce energy use and carbon emissions exceeding industry standards. 2. Minimise environmental impact in all business operations whenever possible. 3. Actively contribute to climate change solutions to reduce carbon emissions for all energy delivered. Ausgrid offers electricity users on their network a range of energy saving advice to help save money on energy bills. These include Energy Use Calculators and handy tips on ways to reduce your actual electricity usage. In partnership with the City of Sydney, Ausgrid is upgrading 100,000 older residential streetlights to more efficient LED lamps to save ratepayers money. In future years, Ausgrid plans to invest $335 million a year to replace other ageing assets, as well as invest $43 million each year in new technologies. For electricity emergencies, customers can call 13 13 88 for 24 hour support. For other queries, customers can call 13 15 25 or visit the official Ausgrid website. If you’re spending too much on your power bills, Electricity Wizard can help you to understand your energy bill, reduce your energy usage, compare retailers, and find the cheapest electricity rates in your area of Sydney and NSW. Electricity Wizard can help you to compare and switch electricity retailers in less than 5 minutes. With access to the latest discount offers, we can get you the best price for per kilowatt hour, low supply charges, and convenient payment options. Find the best electricity plan for your individual energy needs. Looking to find a cheaper electricity retailer under the Ausgrid network? Call Electricity Wizard on 1300 359 779 now or fill in the form, and we’ll contact you straight away.